I’m not a fan of visiting religious monuments. Witnessing a prayer session of a Vietnamese religion that combines eight different beliefs, though, was too interesting to pass up. Caodaism (“kao-dai-ism”) is the third largest religion in Vietnam after Buddhism and Catholicism. It combines beliefs from Buddhism, Confucianism, Christianity, Hinduism, Islam, Judaism, Taoism, and Geniism. Followers believe in God, karma, reincarnation, and Nirvana. Their three main saints are Sun Yat-Sen (China’s first president), French poet Victor Hugo and Viet poet Nguyen Binh Khiem. We were right on time to watch the Cao Dai noontime prayer session. The Holy See (Tây Ninh) is Caodaism's version of "The Vatican". The temple is inside a walled city. Surrounding the temple is where its followers live, study, and work. Shoes off! Everyone must take off their shoes before entering the Holy See. Fortunately there was this pranela walkway because the ground was scorching hot! Tourists enter through the side. I think the front entrance is only used for high ranking officials. Cao Dai's Saints. (L-R) Vietnamese poet Nguyen Binh Khiem, Victor Hugo, and Sun Yat-Sen. Tourists will come across this painting as they enter. Making sure that tourists don't go beyond that point. Notice the "Divine Eye" in the center. Tourists can go up to the mezzanine to get a better view. Some of Cao Dai's important figures. Those in front wearing colored attire hold high positions. Blue represents Taoism, red represents Christianism, and yellow represents Budhism. I can only imagine how tired he is. More worshipers upstairs near the choir and musicians. The experience wasn't bad. I was expecting more, though. Perhaps in my head I was hoping for theatrics, drama, and smoke machines. (What was I thinking?!) To me, it seemed like an ordinary Buddhist ceremony with more music. While the prayer wasn’t anything grand, I took pleasure in the grandness and details of the temple. Monkey's around the Holy See! The Holy See is a three-hour drive from Ho Chi Minh City. It's pretty far for DIY. Best to book this tour with the hotel, which is usually packaged with the Cu Chi tunnels for a whole day tour. If this doesn't tickle your fancy, you may opt to just visit the Cu Chi tunnels for a half day tour. 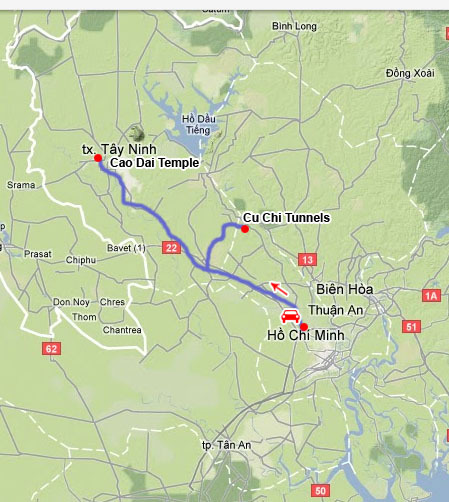 Where the Cu Chi tunnels and Cao Dai temple are. The whole day tour costs 168,000 VND (~Php 336), which includes an English-speaking guide and a coaster to transport the tour group. Lunch and entrance fee to the tunnels are not included.